There are many football blogs in Southeast Asia that provide relevant news stories and updates about football matches and programs in the region. Through email, I interviewed Erick Bui of Vietnam Football and Chamroeun of Cambodia Football Roubroum about football blogging in Southeast Asia. 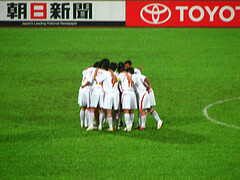 Football is unarguably the main and most supported sport in Vietnam. Its annual V-League competition has taken place since 1980. When Vietnam was split into North Vietnam and South Vietnam, two national teams existed…After Vietnam was united in 1975, Vietnamese football suffered a long time of stagnation. In 1991, Vietnam national football team played its first international match. Vietnamese football has made a lot of improvement since then. Both Vietnam national team and V-League are now one of the best in ASEAN region. I launched my personal blog on July 2008. My main goal is to spread the news on Cambodian football. I noticed that our two neighboring countries, Thailand and Vietnam, have better football programs. The players are well-paid. But in Cambodia, the footballers are not really in good condition. Most of them play for free or with low salaries. However, our football has changed a lot in the last five years. Now we have a professional league which is sponsored by a Vietnamese company. Erick and Chamroeun are also linking to other football blogs in the region. They recommend these websites: Jakarta Casual for Indonesia and Singapore, Thai Port Football Club for Thailand, S-league: Facts & Figures for Singapore, Filipino Football for the Philippines, Soccer Myanmar, Foul from Malaysia and aseanfootball.org which gives regional sports updates. These blogs also link to local football websites. Haresh Deol, the blogger who maintains Foul from Malaysia, discusses sports betting which was a big issue in Malaysia a few months ago. I’m not for gambling, as I’m not for smoking. If it’s unhealthy, it's unhealthy. But if it's a good method to monitor the outflow of our Ringgit (author’s note: Malaysian currency) and a source of income for the government, why not? Thanks for highlighting football blogging in the region. thanks steve for appreciating the post. sorry andy i missed your blog. i’ve been following your blog for years already. how could i miss it. sorry. I like Foul! from Malaysia. The author is very critical and his pieces are thought provoking. Jakarta Casual is cool too.